PASADENA, Calif. (Feb. 9, 2017)  The Tournament of Roses has officially announced the full lineup of marching units for the 2018 Rose Parade to be held Monday, January 1, 2018. 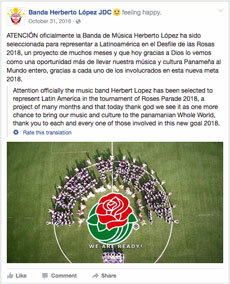 The outstanding roster includes 22 bands from across the United States plus Canada, Australia, Panama and Japan. Tournament officials began extending invitations last fall to give marching bands enough time to raise funds and prepare for the trip to California. Social media accounts buzzed with excitement as individual bands posted news that they had received a coveted invitation to the spectacular New Year's Day event. 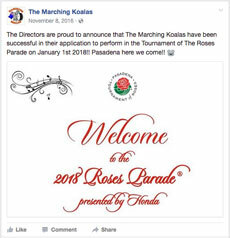 The "Marching Koalas" band from Australia, which also appeared in the 1993 Rose Parade, exclaimed "Pasadena here we come!!" on Facebook after receiving an invitation in November. Another selection in November was revealed during the Bands of America Grand National Championships in Indianapolis. Tournament of Roses 2018 President Lance Tibbet was on hand to personally extend an invitation to the Ronald Reagan High School Marching Band from San Antonio, Texas. The Reagan Band delivered impressive performances in the competition and advanced from prelims to semi-finals to finals. The invitation made the success at Bands of America even more special, according to Daniel Morrison, Director of Bands at Reagan High School. "I was beyond thrilled when it was announced that we were chosen to participate in the 2018 Rose Parade," Morrison said. "The students were in shock because they had no idea a Rose Parade selection was even a possibility! They are so excited to have the opportunity to march in such a prestigious parade. 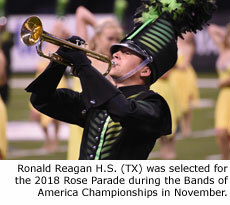 "This is the first Rose Parade selection for Ronald Reagan High School Marching Band. The dance and band programs have a very close relationship, and the members of the dance team will march in the parade as well. The dance team has been a part of Reagan's competitive field show for the last two seasons." The University of Massachusetts Minuteman Marching Band will also be making its first appearance in the Rose Parade. Band members learned of their selection on October 29 while the band was on the field for its halftime performance at the final home football game of the season. A video message from 2018 President Lance Tibbet was played on the big screen, prompting big cheers from the crowd and the band. The reaction of the UMass students is captured on a Twitter video which can be viewed below. • "The Commandant's Own" The United States Marine Drum & Bugle Corps, Washington, D.C. Looking ahead ... the deadline for bands to apply to the 2019 Rose Parade is May 31, 2017.